In this article, we’ll show you how to display data from your Salesforce reports on your Geckoboard dashboards. Salesforce reports are a powerful tool for making sense of all that data available within your Salesforce account. Our Salesforce integration makes visualizing your Salesforce reports really easy – you create the reports in Salesforce first and then build visualizations using those reports in Geckoboard. Just starting out with using Salesforce reports? 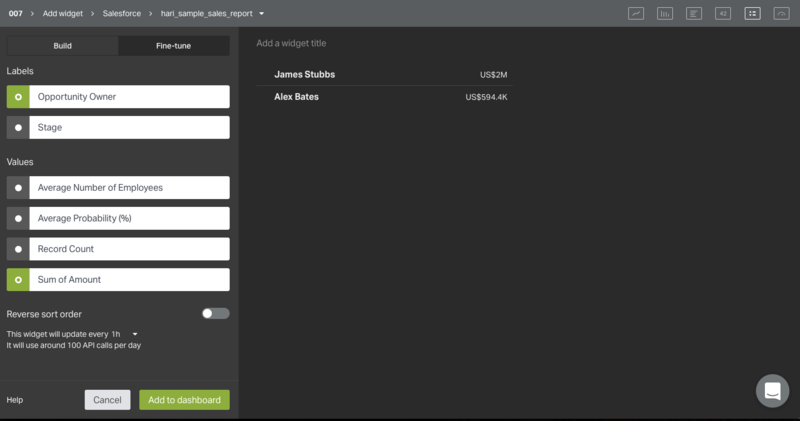 See our article on creating a report in Salesforce for Geckoboard. We also have a Salesforce reporting basics blog post that you may find useful. For a more detailed guide to creating reports, see Salesforce's documentation. Salesforce provides a collection of standard reports by default. These will not show up in Geckoboard, and you cannot visualize data from them on your dashboards. You can create a custom report by either building a new report from scratch, or by customizing an existing standard report to your requirements. Create a custom Summary or Matrix report for tracking the metrics you're interested in — just as you'd normally do in Salesforce. 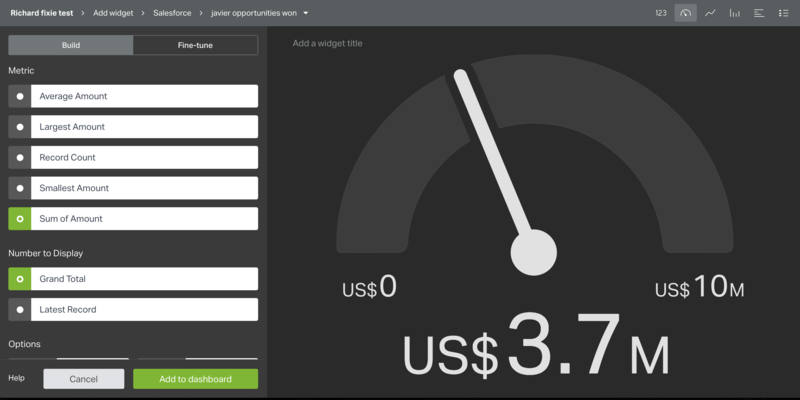 Geckoboard will then be able to pull in and display those metrics on your dashboards. If you'd like to use Joined reports, drop us a line and let us know how they'll be useful to you. Save your reports in a folder that your Salesforce user account (i.e. the one connected to Geckoboard) has access to, or under public folders. Geckoboard cannot read private reports that your Salesforce user doesn't have access to. 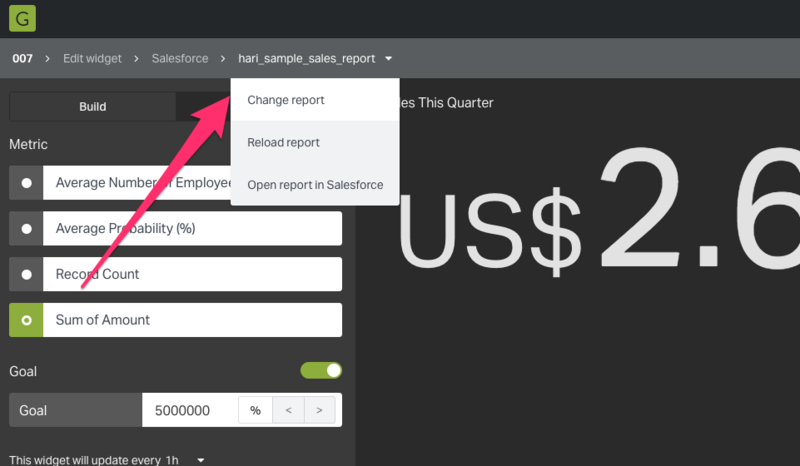 Create a new report or make changes to an existing one, make sure to run the report as well, using the Save and Run Report option within Salesforce. The data within your reports need to be aggregated using groups to be plottable in a chart. So, regardless of whether you’re using a Summary or Matrix report, you’ll need to have at least one grouped field (column) within your Salesforce report. Otherwise, you’ll receive an error such as Cannot read property 'xAxis' of undefined or similar depending on your browser. You can find more details in our Salesforce troubleshooting article. Summary reports can have up to three groupings while Matrix reports can have four (two row and two column groupings). For Matrix reports, you can't use the same field for both row and column groupings. Grouping your report data will also automatically provide you with the record count metric (number of items) for each group. 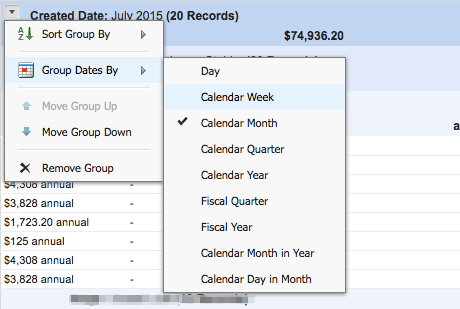 If you group your report by a date field, you can click the group menu, select Group Dates By, and specify the grouping time frame: day, week, month, quarter, year, etc. Showing the record count (number of items) for each group is useful, but often you’re interested in other metrics as well – for example, the total sales value or average probability. This is where summarizing your report data comes into play. Any numeric property can be added as a summary field. The report builder in Salesforce gives you the choice Sum, Average, Min, or Max. Summary fields show at all grouping levels (that is, for each group within your report + even if there are multiple groupings). In Summary and Matrix reports, they also appear at the grand total level. The grouped fields from your report act as the base while the summary fields act as the metrics. That is, you can plot a summary metric against a grouped field. Line Charts, Column Charts, and Bar Charts: Grouped fields will be available as the X-Axis options, while Summary fields as the Y-Axis options. Leaderboards: Grouped fields will be available as the 'Labels' options and Summary fields as the corresponding 'Values'. Number and Gecko-O-Meter: As these widgets can display only numerical data, they display values from just the summary fields. The value displayed will be the summarized metric (i.e. Sum, Avg, Min, Max) calculated based on all the records available within the report. For example, the metric displayed can be Sum of Total Sales Amount, Average Probability, Maximum Price, etc. On all widgets, the Record Count (number of items) summary metric will always be available for each grouped field within your report. Search for Salesforce using the Search sources field. Alternatively, you can also scroll down the alphabetical list of integrations until you reach the Salesforce integration. Click on the Salesforce integration. If you haven’t already, you’ll be prompted to connect your Salesforce account to Geckoboard. We do not support custom domains. 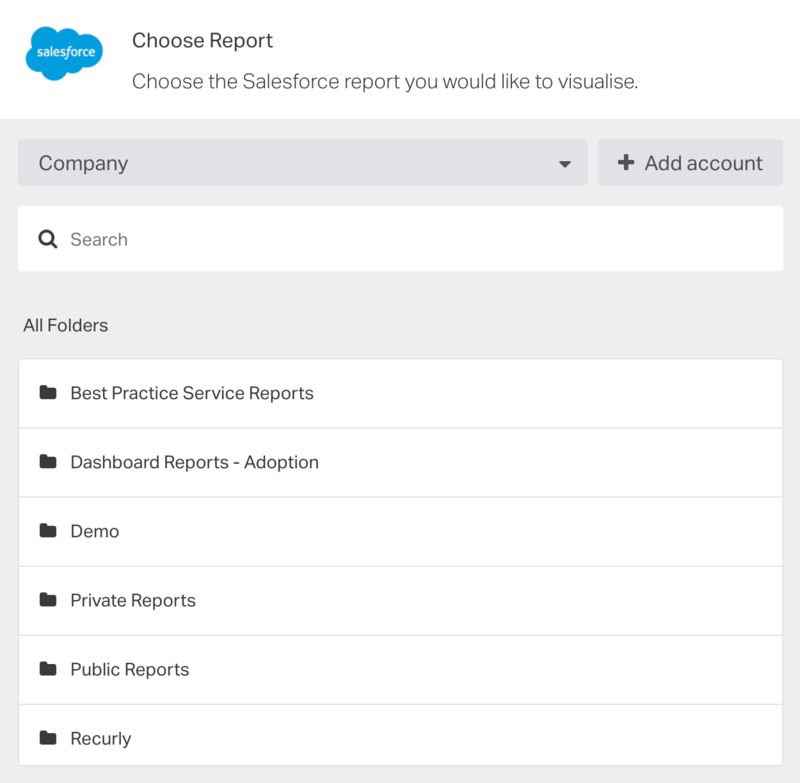 You'll now see the Choose Report page, which displays the list of your Salesforce reports folders. You can use the Search field or manually navigate through the folders to your chosen report. Click on the report. The widget configuration page will show up — this is where you actually build your widget. Select the visualization from the top right. You'll see a preview of the widget. If required use the  toggle switch to set a Goal and fill in your Goal value. You can also specify whether it's a Less than and More than Goal. On the Number widget, you'll have the option to Track % progress toward the Goal. While on the Geck-O-Meter, you'll have options to also specify the min. and max. values. Next, click on the Fine-tune tab, towards the top-left, to configure abbreviations, decimal places, and units. You can leave these at their default Auto settings if things already look good. Once you’re happy with how your widget is previewing, switch back to the Build tab. From near the bottom-left, specify how often you want this widget to refresh. It'll also let you know how many API calls the widget will use per day. You'll need to specify the refresh rate for each Salesforce widget you add. We have a useful guide which explains how to choose an appropriate refresh rate and offers some suggestions on how you can optimize and reduce the number of API calls used by your Geckoboard widgets (especially helpful if you have a lot of Salesforce widgets on your dashboards). At any point, while configuring your widget you can Change report, Reload report, and Open report in Salesforce. Any changes you've made within your report will be picked up and fetched immediately into the widget. This is especially handy when initially building the widget or while testing things. When you're happy with all the widget settings, click Add dashboard. Hover over your newly created widget and add a widget title. Drag the bottom right corner of your widget to adjust its size. How to troubleshoot issues with your Salesforce widgets. A Sales Dashboard example and step-by-step guide to building it from scratch using our Salesforce integration. We explain how to build some useful and interesting Salesforce widgets there!